Aylesbury's finest come back with Marbles, their first studio 2-CD. 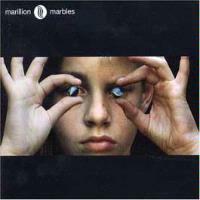 Marbles is prog at its finest - the band knows how to write and play in a more conventional structure, but they haven't lost their knack to construct longer pieces that never meander. Fans of the band will hardly be disappointed in this top-notch effort. There's a sinister edge throughout this 13-minute opener, even though it runs through several movements. This is fitting since the subject of the song appears to have become invisible against his will. The 7/4 section that kicks in at around the 6:30 mark is especially harrowing. The first of four short interludes in this album, this is a laid-back affair with a slight cocktail-jazz feel to it. This is a mid-tempo number, heavy on the guitar and with some nicely understated vocals on the bridge. Hogarth is at his most soulful on this tune that builds ever-so-gradually. We don't know what it is, but Hogarth runs through an imaginative litany of what it does. Mark Kelly's organ adds a hymn-like tone, and Ian Mosley's percussion keeps the song from plodding. This piece sounds rather Lennon-esque with the melody and the Phil Spector-like production. The band pays homage to Don Allum and the Ocean Rowing Club, a group who have a penchant for rowing solo back and forth across the Atlantic. At 18 minutes this song is perhaps the focal point of the CD. It keeps moving with an ebb and flow of tempos and feelings. Like "Out of This World" from the Afraid of Sunlight album, this piece also uses actual audio clips of the subject at hand to good effect. Leading off the second CD, this short piece is highlighted by Mark Kelly's simple melodic lines and Hogarth's slightly disturbing lyrics. It almost sounds like Marillion is borrowing from the Jeff Lynne songbook on this one. The lyrics come mostly from "Genie." This is a relaxed rocker, and the lyrics basically encourage you to forget the past and live each day afresh. An interesting side note - Pete Trawavas and Steve Rothery switch roles on bass and guitar, Pete driving the song with his acoustic guitar strumming. The first single pulled from the album, this song is much like a latter-day Genesis composition but without the sap quotient that plagued them in later years. This is another example of Marillion's ability to write and record a song in a more "traditional" vein. A smoky, late-night jazz feel kicks off this paean to an over-night disk jockey. The song doesn't pick up much steam after that, though, lending to an intimate, relaxed mood. Musically this is pretty much a reprise of Marbles I with a slight change in the chord progression. After a rather soulful first few verses, the band get into an extended slow funk jam on this 12-minute closer with Steve Hogarth repeating vocal lines, and Steve Rothery adding simple yet powerful guitar fills. The band ends short of the 11-minute mark to the delicate sound of wind chimes to close out this incredible, sprawling album.